When you own a warehouse, retail store or even a restaurant, you want that space to be streamlined, professional, and possess a clean look. Utilizing different types of storage options can help you achieve this vision. 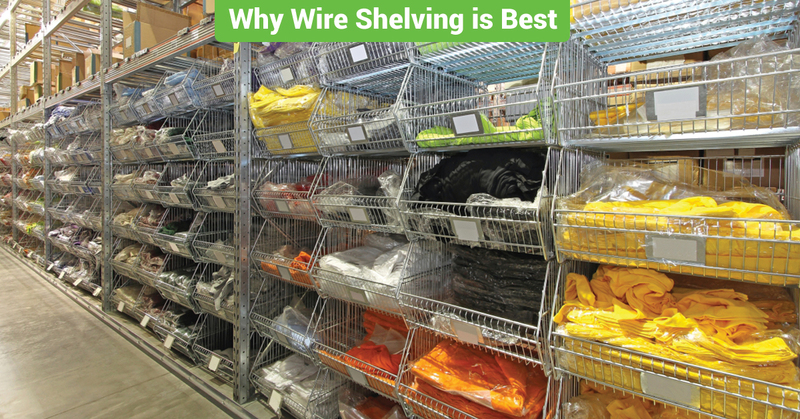 One of the most versatile and durable storage solutions is wire shelving. Wire shelving is similar to a blank slate, and you can design the fixture to your business’s aesthetic and also utilize its wonderful use of storage. At Felix Loeb in Chicago, we make your storage solutions simple, accessible, and affordable. Our Chicago-based company is here for all your needs, big or small. Not only do we have amazing wire shelving but we also carry pallet racks and mezzanines for the biggest spaces. Wire shelves come in all shapes and sizes and can be used for many reasons. Wire shelves are great for clothing businesses, as you can stack multiple items of clothing folded on each shelf tier to create a clean and modern store front. Wire shelving is also very beneficial for restaurant type establishments due to the fact the shelves will not allow for dust or debris to collect, creating a safe and sterile environment for produce and other edible items. Finally, wire shelving is great in a warehouse type setting. It provides a good place to store orders, returns, or other stock, so that it is easily accessible and not difficult to find. If you are a new business or have been in business for 20 years, things are always changing. Another amazing attribute to wire shelving is that it can be adapted as you need it to be. Wire shelving is easy to change and manipulate to what you require it for. This makes this storage solution beneficial as you won’t need to purchase new measures for a growing business. The other perk is that wire shelves can be easily moved since they aren’t dramatically heavy and placed permanently. You can enjoy knowing you will be prepared for whatever storage needs come your way in Chicago. Since wire shelving is made of steel, it is extremely durable and a great storage option for any type of business. If you have had or do have hardwood shelving, they require much more maintenance because they can become scratched up and dented fairly easily. Not only can these happen on accident, but they also will need to be sanded and stained every so often to continue looking pristine. If you have a storefront where customers are present, this is imperative to keep your business looking clean and professional. When choosing wire shelves from Felix Loeb, you don’t need to worry about polishing or staining ever again. Our shelves are metal and will look good in any setting and if anything, they require a nice polish every once in awhile to keep it shining brightly. When you run a business, you need to cut cost where it matters. Spend more on the product than your storage maintenance. Having wire shelving will give your business the storage it needs but will not put a hole in your wallet. Wire shelving provides all the functionality you want for storage solutions but doesn’t have nearly the hassle and price point of wood shelves. Wire shelving is durable, manageable, and looks great in any type of setting. If you have a business and are looking for a better way to organize, give Felix Loeb in Chicago a call. Our storage solutions are what you need to keep running your successful business. We have everything from small storage solutions, such as wire shelving, to large structures such as our mezzanines and pallet racking. We know running a business means you have a lot on your plate; that’s why our company is here to help you take control and organize your space to the best of its ability. Having a clean and organized area will entice customers to shop more, eat out at your restaurant, or order from your warehouse. Check out all our other storage solutions and get started with Felix Loeb today. Keep checking in on our blog for more tips on how to organize your business!